The best marathon running shoes have to meet especially high standards. After all, you’re not just running leisurely. You are running a marathon. And if you are a serious runner, a marathon is a serious matter. To complete a marathon, you need a seemingly endless source of energy and a stamina that can take you from the beginning all the way to the finish line. And when you’re running the marathon, the last thing you want to worry about is your shoes. You should worry about your marathon running shoes before you even fall in line with the other runners. By the time you start running, you have to have complete confidence in your shoe. There are several important requirements you have to consider when choosing the best marathon running shoes. Here are the three most important requirements. It is very important for your marathon running shoes to match your foot type. Marathons can be long and grueling if your shoes don’t match your foot type. A cushioning running shoe on an overpronator can cause stability problems and can compromise the person’s balance. A motion control shoe on an underpronator can cause muscle strain in the foot and can increase the risk of injuries. So before you invest in a marathon running shoe, make sure you know the biomechanics requirements of your feet. Flat-footed marathon runners should get shoes that have motion control features. A rigid midfoot and a snug fit can help prevent unnecessary pronation. A post or piece of foam wedged under the arch area can prevent the excessive inward rolling motion that causes overpronation. High-arched runners should get shoes with plenty of cushioning and with some support for the unusually high arch. Padding is necessary in the arch area and the outsole for better distribution of impact. Those with normal or neutral feet should have shoes with combined cushioning and stability. Since a marathon can be rather tiring, you can really use additional sources of energy that can pump you up even in the middle of the marathon. So why don’t you get shoes that can give you a powerful surge of rebounding energy? This is the concept that drove the engineers over at Nike to come up with Air-Sole cushioning units. The Air-Sole cushioning units provides the runner with a forceful push forward each time the foot lands. As the foot lands, the air-based cushioning units compress then slowly expand again. As it expands to its original height, it pushes the runner off the ground as well with added energy. This is why the Nike Air shoe series makes some of the best marathon running shoes such as the Nike Air Pegasus or the Nike Air Max Moto. Imagine the scene. You are running a marathon, and the sun is beating down on you. You are perspiring and are running at your best. But your foot feels so heavy now, and it’s growing heavier with every step you take. Your foot muscles also feel strained. You feel yourself slowing down. That’s what can happen if you choose the wrong shoe. In this case, the wrong shoe is a running shoe that’s heavy, bulky, and restrictive. This is why you need a lightweight and flexible running shoe. Nike recently came out with the Flywire technology which trims down the weight of their shoes without compromising on its many features. Asics shoes are also known to be exceptionally lightweight. Flexibility is important so your feet can take free and efficient strides without having to exert force and energy. The Nike Free V4, which mimics barefoot running, is the most flexible shoe in the market, making it one of the best marathon running shoes around. The list of the best marathon running shoes does not stop there. There are several other shoes that make mean marathon companions. For underpronators, check out the Asics Gel Nimbus for underpronators with its superior cushioning. For motion control and support, there’s the Asics GT 2140 and the Brooks Adrenaline GTS. For neutral runners, the Asics Gel Kayano is there to save your marathon experience. These shoes are what can be called as the best marathon running shoes in the market. 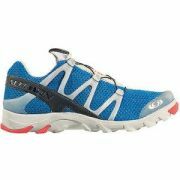 The Best Running Mens Shoe Your Shoe, Your Companion, Your Partner - The best running mens shoe is not easy to find. There are many considerations you have to make, and the shopping process can take very long. Best Women Running Shoe For Every Type of Female Runner - The best women running shoe requires a challenging hunt to find. It really is a hunt, since you have to make several stops along the way. These stops are equivalent to the factors that you have to consider to find the best shoe for female runners. Best Lightweight Running Shoes Newest Technologies to Trim Down Running Shoe Weight - Lightweight running shoes are the in thing these days. Running shoe manufacturers are now able to come up with more and more running shoe technologies that do what they need to do without adding any weight at all. Best Trail Running Shoes Three Steps to Identifying the Best Shoe for Trail Running - The best trail running shoes have to be a lot of things that regular running shoes dont even have to bother with. This is because trail running gear are faced with greater challenges and heavier demands.